“Aspirant Partner”, a new type of participation, is offered to new countries interested in being part of FAIR a progressive path to membership. FAIR Council, the shareholders’ meeting of FAIR GmbH, has created it in 2017 and decided in December 2018 to recognize the Czech Republic as the first FAIR “Aspirant Partner”. The contract has been signed by the managing directors of GSI and FAIR Paolo Giubellino, Ursula Weyrich and Jörg Blaurock, as well as by Petr Lukáš, Director of the NPI. Czech partners in the FAIR-CZ consortium – represented by Vojtěch Petráček, Rector of the Czech Technical University in Prague; Gabriel Török, Vice-Rector of the Silesian University in Opava; Jan Kratochvíl, Dean of the Faculty of Mathematics and Physics, Charles University; Vladimír Baumruk, Vice-Dean of the Faculty of Mathematics and Physics, Charles University; and Andrej Kugler, large research infrastructure FAIR-CZ coordinator – took part at the signing as well. “I am extremely pleased that we can warmly welcome the Czech Republic as our new partner state. The partnership can build on a long-standing, very good working collaboration between Czech research institutions and GSI/FAIR. Researchers from the Czech Republic are already making excellent contributions in a variety of scientific and technical fields at GSI and FAIR“, said Paolo Giubellino, Scientific Managing Director at GSI and FAIR. Czech scientists are involved, for example, in the large detector HADES and in nuclear astrophysics as well as in developments and research for the CBM and PANDA experiments. They are active in all 4 FAIR research pillars, and intend to also contribute to the construction of components for the FAIR accelerators. The commitment of the Czech scientific community to FAIR is growing rapidly. In 2016, 37 scientists from 4 scientific institutions in the Czech Republic worked on topics related to the FAIR project, this year it will be more than 60 from 6 different scientific institutions. „It is a great pleasure for us to become partner of FAIR with its worldwide unique research opportunities. 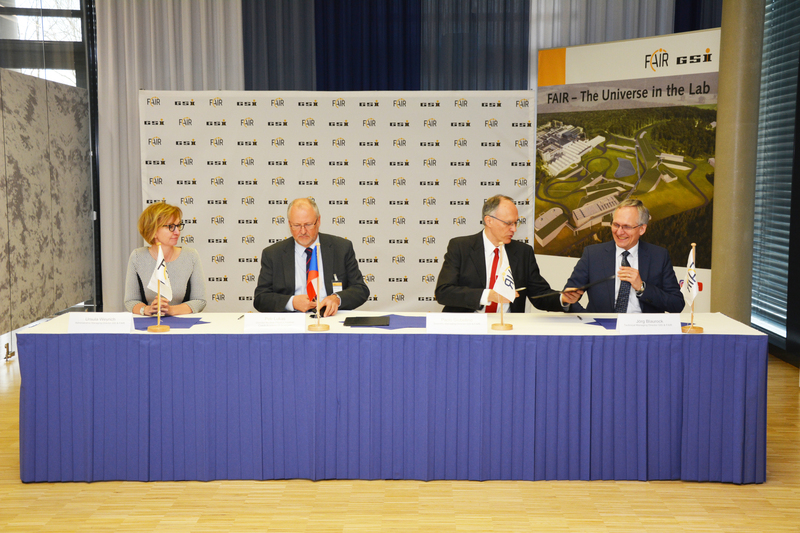 The new agreement paves the way to a strong long-term collaboration between the Czech research community and FAIR. The membership will further intensify relationships of our scientists with GSI and FAIR and create opportunities for an even more fruitful cooperation in areas such as research, education and innovation“, said NPI Director Petr Lukáš. When signing the agreement, the partners underlined their wish to strengthen sharing of scientific knowledge between the Czech and other European research communities and emphasized the breakthrough value of science to be performed at FAIR. In addition, the new cooperation once again shows the attractiveness of the FAIR experimental program and the trust of the international research community in the FAIR project. The current signing of the contract has great appeal for encouraging other countries to join the FAIR project with its great scientific and technical significance.